Do remember that dishonesty and cowardice always have to be paid for. Don’t imagine that for years on end you can make yourself the boot-licking propagandist of the Soviet regime, or any other regime, and then suddenly turn to mental decency. Once a whore, always a whore. As someone who has always preferred to mark Orwell’s birthday, I suggest ignoring all of this hoopla, especially as it seems a reasonable bet that he would have hated the idea of Orwell Day. 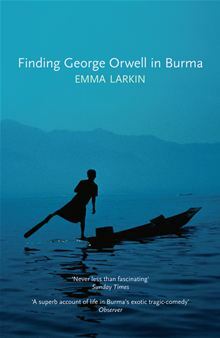 Instead, pass some time with Emma Larkin’s Finding George Orwell in Burma, a mixture of travel, historical and political writing, which contains much to surprise and inform even the dedicated student of Orwell. What did you expect? That we would all be sitting around on the pavements crying? free to write whatever we want. We’re just not free to have it published. and their relevancy to Burma, where all mention of the huge uprisings which took place in 1988 and their suppression have been erased from official histories. Restoring the country and its people to ‘normality’ will be no easy task. uses Burma to explain Orwell, and Orwell to explain the miseries of present-day Myanmar. It is an excellent and engrossing read, informative yet not in a dry way, featuring characters who, although they must be heavily disguised, remain vital and lively companions. I found Finding George Orwell in Burma to be an illuminating tour through a country which shaped the man, informing his most celebrated books and turning him from disaffected colonial policeman into a writer unafraid to denounce totalitarianism, wherever he found it. I’ve gotta stop popping by. Every time I do, I have to add another book to the to-read pile. DON’T: click on the link to the Emma Larkin interview or that’ll be another few books to add to the list.